This historic ranch was started in 1881 as a partnership of D. B. Gardner and Col. J. S. Godwin. The holding company Pitchfork Land and Cattle Company was formally organized in Missouri in 1883 and the founding shareholders were A. P. Bush Jr., Sam Lazarus, D. B. Gardner, W. H. Carroll, E. F. Williams and A. D. Brown. Gardner and Williams had been boyhood friends from Mississippi. Prior to the 1883 formation of the holding company, Williams had been a sales manager for Hamilton Brown Shoe Company, and Gardner had been a surveyor in Texas. Legend has it that rancher Samuel Burk Burnett won the ranch in a high stakes poker game and that another player, out of money, had bet his ranch on his poker hand, only to lose to Burk Burnett’s hand of four sixes. It makes a great story, right? Burnett denied the story more than once. Nevertheless, the legend has endured and 6666 has been the ranch brand. The Matador Ranch is unique in that for the first 70 years of its existence it was owned either by a number of people or a syndicate, rather than having been owned by one family or a partnership. The Matador Cattle Company was founded 1879 by five individuals: Col. Alfred Markham Britton, Henry Harrison Campbell, Spottswood W. Lomax, John W. Nichols, and a brother in law of Britton known only by the name of Cata. The ranch’s name was coined by Lomax, who is said to have had a keen interest in Spanish literature. 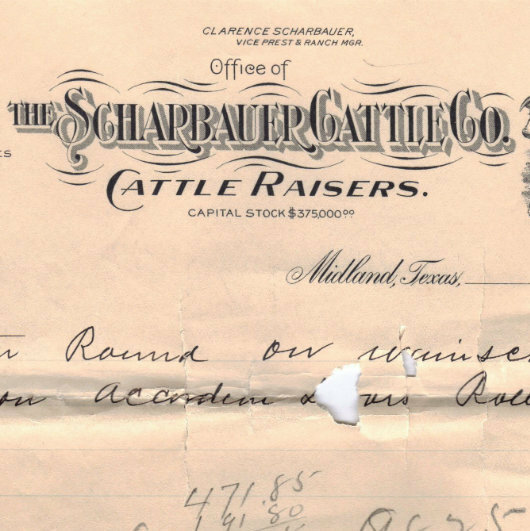 The Scharbauer Cattle Company is well known in West Texas. Clarence Scharbauer, Sr. was born August 18, 1879 in Albany County, New York to Christian and Jennie Scharbauer and was also the grandson of Ferdinand Scharbauer who had come to America from Holland. Christian’s brother John had come from New York to Eastland, Texas in 1880 where he established a sheep ranch. A few years later, John moved further west to the Abilene area and then in 1884 he moved again to Mitchell County in the general vicinity of Colorado City. His sheep business prospered but John became interested in raising cattle, purchasing his first bulls and cows in 1888. Encouraged by his success, by the mid to late 1890s, he had shifted his production entirely to cattle and become one of the leading cattlemen in the state.